It’s summer time, which means I am thinking about food. 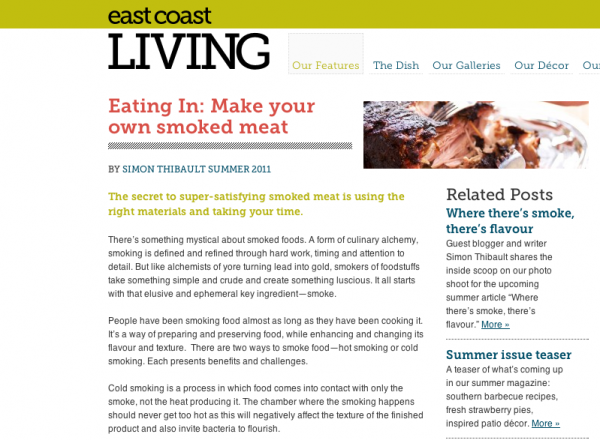 I had the luck of writing a story about barbecued and smoked foods for East Coast Living. The article includes interviews with New Brunswick chef Jesse Vergen – whom I recently interviewed on Passable – as well as fellow Saint John resident, Michael Hawkins, from Food Funk. The photos for the article were taken at Cole Harbour’s own Aaron Legge, who blogs about his barbecue escapades at SchoonDawg Barbecuin’. Image courtesy of East Coast Living.